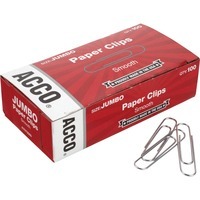 Jumbo paper clips provide a firm grip without scratching paper. Quality steel, tin plated paper clips resist corrosion. Elliptical shape delivers superior holding power. Paper clips are suitable for everyday office, home or school needs. Large size holds a thicker stack of papers than standard size paper clips.